Sometimes I feel like there are gaping holes in the list of books I've read. I'll look at a title and ask myself, "How have I not read this yet?" because it will be something that has lots of positive critical reviews or tons of great reviews from bloggers. 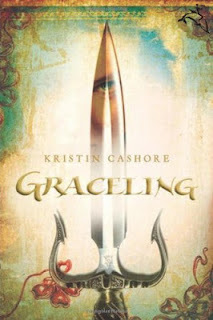 Graceling by Kristin Cashore has been one of those books for me until very recently. Anyways, Amy, Asheley, Lisa, Tara, and I are all reading the books together. Lisa made the button and Tara has not read the books before either. After exchanging numerous e-mails, we've decided to read five chapters at time and use the hashtag #cashoregoodtimes to discuss the books on Twitter. So if you want to join us and talk about these books, please feel free! Remember that the hashtag is SPOILER FREE. The goal is to have the next 10 chapters read by next Friday. I'm eager to finally get all three of these books read. So far, Graceling is off to a great start. This one's been on my to-read list too. I may have to locate a copy and join in. I'm not sure if I'll be able to keep up, since it's finals week and then I'm going to my in-laws for Christmas and want to spend time with them instead of imaginary people. But I can probably read the first one at least. I loved Graceling so I hope you love it a lot too-I think it's absolutely amazing and just gets better as you read more!